Now, we could have delved into the history and statistics of the Brazilian Wax, while visiting the country, but instead we’ll delve into the intricacies of Carnival, an event which gathers folks from around the world for music, masks and revealing costumes! Trust the Sip Advisor, I pushed hard at the creative team meeting to do the wax article, but was shot down by the powers that be… oh well, it’s time to party on! Carnival lasts four days, leading up to Ash Wednesday and is considered one of the world’s largest celebrations and parties. The national holiday also marks the beginning of Lent, which encompasses 40 days of sacrifice en route to Easter. 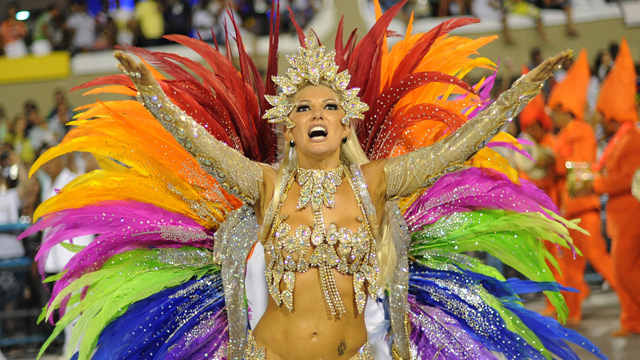 The event is celebrated differently in various regions of Brazil, where everything from music to costumes can differ, but Rio de Janeiro is home to the most-populated Carnival experience and therefore the location we’ll focus on. I decided that every photo for this article will feature a beautiful woman… life is pretty great when you’re running the show! The first Carnival took place all the way back in 1723. The term comes from carnelevare, which loosely translated means “to remove meat,” one of the items traditionally neglected during the period of Lent (and why I’ve never been a Lent-suffering person). Over time, Carnival evolved to include masquerade balls before the lively parades that the event is known for today. The highlight of Carnival is the Samba Parade, which sees all of the different groups (200-plus) compete in the Sambrodromo, where they are judged based on their floats, costumes, dancing, and music. Some groups spend excessively on these requirements, sometimes into the millions of dollars. All this, despite the units being largely made up of Brazil’s poorest citizens. I hope they do more than car washes to raise the necessary funds. Given the two million-plus people lining the streets each day of Carnival, many Brazilians will retreat to quieter, more relaxing places for the duration of the festivities. I can’t really blame them. As much as I’d love to party in Rio for the week, I don’t do well in crowds – at least ones that aren’t caused by being in a Disney theme park – and probably wouldn’t be able to completely enjoy myself. Your plumage is fierce, babe! Another reason for the locals to get out of Dodge, is that cities around Brazil practically shut down for Carnival. Only industrial operations, malls, restaurants, hotels, and other businesses needed to stay open for the celebrations remain active. Despite the closures, 250,000 jobs are created thanks to Carnival, which generates hundreds of millions of dollars for the country’s economy. Carnival can cause Brazil to become a tourist trap, with the price of accommodations jumping sharply, sometimes four times what they would normally cost. The 1959 film Black Orpheus introduced many foreigners to the Carnival revelries in Brazil. The movie was set in Rio and featured numerous local actors, as well as a soundtrack highlighted by legendary Brazilian performers. Black Orpheus caused outsiders to fall in love with the sights, sounds, and vibrancy of Brazil and later won the top prize at the Cannes Film Festival, as well as an Oscar for Best Foreign Film. In Rio, parades begin at 9:00pm and don’t end until 5:00am, with the city’s metro system open 24 hours on parade days. Performers must wear a costume, which can include masks, headdresses, feathers, and exposed skin! Carnival takes place during the hottest part of the year for Brazil, which means tons of sweaty, sunburned, dehydrated folks… you’ve now been warned! Nothing wrong with pluralizing my earlier comment! Although there is an overwhelming number of public toilets placed around the cities hosting Carnival events, ‘Pee Patrols’ have been set up to stop partygoers from relieving themselves in the streets. I wish we had these officials in my neck of the woods. Too many times, the Sip Advisor walks into his building’s back alley and is greeted by the pungent aroma of urine. There is also Micareta, which occurs in the off-season and allows locals to celebrate without all the lame tourists invading the country. For us travelers, let’s get this party started! Now that you’re all partied out, it’s on to the next stop of our journey. While we leave Brazil with a new fondness for the country in our hearts, we soon realize that our wallets are no longer intact… a true Rio de Janeiro experience! The name of this drink, Leite de Onça, translates to Jaguar Milk and one can only hope the drink will give you the powers of the big cat. I have to say that I was quite impressed with the recipe. 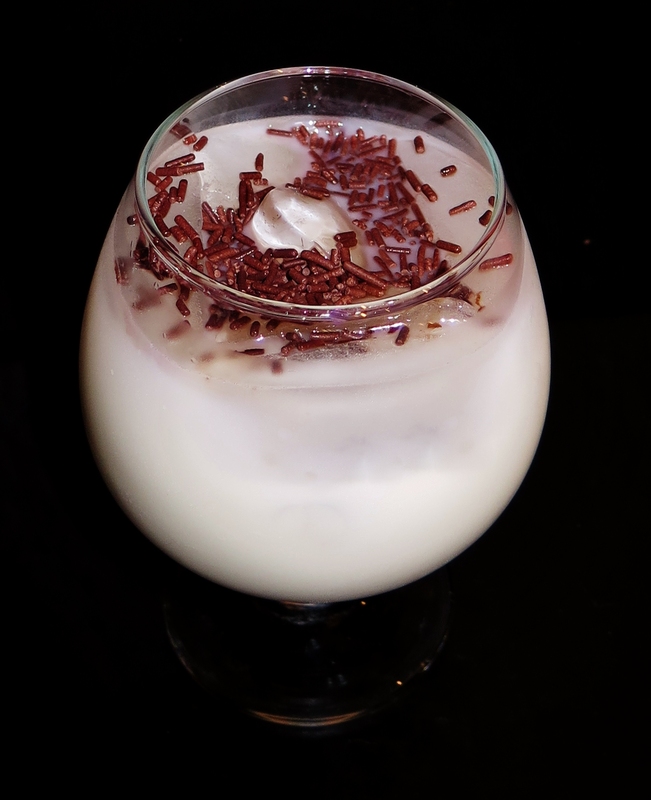 You can never go wrong with mixing Crème de Cacao and Milk (takes me back to Nestle Quik as a little sipper) and although I was apprehensive about adding Cachaca to that tried and tested combo, it really worked well. You kind of got a sugar cane rum burn at the end of each sip that wasn’t overwhelming and was actually quite pleasant. Now, I am one with the jaguars! This entry was posted in Crazy & Classic Cocktails and tagged Ash Wednesday, Black Orpheus, Brazil, Brazilian Wax, Cachaca, Cannes Film Festival, Carnival, chocolate sprinkles, cocktail, Crème de Cacao, Easter, Jaguar Milk, Leite de Onça, Lent, Micareta, milk, Oscar, Parades, Rio de Janeiro, Samba Parade, Sambrodromo by Daniel Wilson. Bookmark the permalink.